This is a very practical, step-by-step guide to crafting your channel to be as sticky as possible for new viewers. It teaches you to implement strategies that keep viewers coming back for more and regularly interacting with you and each other. Ultimately, the training leads to momentum that becomes a growing and dedicated YouTube community that’s making a difference in the world. Many of my clients have implemented these strategies and tactics and experienced even more growth than I have! You can, too! To prove my confidence in the value of this ebook, I am offering a generous 90 day, money back, satisfaction guarantee. Just contact me with your order information within 90 days of your purchase. That’s it! If there were a college course on how to launch a YouTube channel, this ebook would be required reading! Millions of people are watching YouTube videos right now. This book will help you reach them! A Task: Something you can do right now on your YouTube channel. A Teaching: In-depth instruction on both the why and the how of the task. Further Reading: Links to other videos and web articles that help you dive deeper into the task. 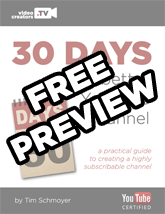 Each day is designed to take you one step closer to creating a channel that entices new viewers to subscribe, interact, and become a loyal part of your channel’s community. Use the link below to download the first 3 days of the book completely for free. No strings attached! Tim has assembled a well-written, extremely helpful guide for video creators who are curious about YouTube. Whether you're a newcomer to the platform or an experienced YouTuber, everyone has something to gain from reading this book. I'm brand new to YouTube. Is this for me? Yes! What better way to get started on YouTube than with a step-by-step guide to setting up your channel and developing a strategy to make it successful? I'm a YouTube veteran. Is this book for me? Yes! Most of the creators I work with have been active on YouTube for a long time, some of them successfully, some of them not. Both groups tend to get stuck in the same approach to their channel they’ve been following for years. This book helps them break out of those ruts and take their growth to new levels. Do I need special software to read this book? Nope. Pretty much all PCs, Macs, and smart phones can open a PDF document. If you can view this book’s free preview, then your computer can handle the whole book. Its length varies depending on your e-reader device and the font size you use, but if you’re using the PDF at it’s default text size, it’s 136 pages long. This is a very practical, step-by-step guide to crafting your channel to be as sticky as possible for new viewers. It teaches you to implement strategies that keep viewers coming back for more and regularly interacting with you and each other. Ultimately, the training leads to momentum that becomes a growing and dedicated YouTube community that’s making a difference in the world. Many of my clients have implemented these strategies and tactics and experienced even more growth than I have! You can, too! This is the go-to guide to understanding YouTube. Whether you're new to the scene or a seasoned YouTuber, you'll find helpful strategies on how to gain an audience and utilize the platform to its fullest.